World professional for extrusions screen changer of manufacturers -- Batte Machinery Co., Ltd. is a professional production and sales of the exchanger, quick screen changer, automatic screen changer, plate type hydraulic screen changer, mesh belt continuous screen changer and melt pump products of high-tech enterprises, strong technical force, long-term development and cooperation with several domestic universities is one of the enterprises specializing in the production of extruder, screen changer and melt pump earlier. 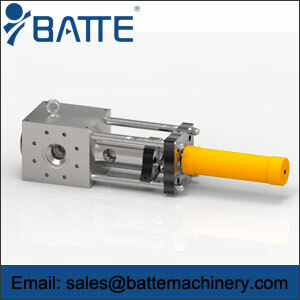 World professional for screen changer of manufacturers , Batte Machinery Co., Ltd. is the production of products has been widely used in chemical fiber, granulation, plastic film, sheet, plate, bar, pipe, wire and cable, drawing, extrusion, composite production line, material processing covers almost the majority of polymer materials, such as: PE, PC, PP, PVC, hips, PS, PA, TPUR, containing fluorine polymer, polyester, polysulfone, thermal plastic elastic body, a rubber and thermal adhesive and so on. Company set scientific research, production and sales, technical training in a body, dedicated to the development and promotion of network converter and melt pump products. Companies from domestic and foreign advanced technology with the industry experience, and strive to create to excellent products, to inexpensive price, perfection of service to create first-class professional for network device and melt pump manufacturer. The screen changer is a manual or automatic switching device which includes one or more filters for filtering the extraneous particles and impurities while the plastic material flow is filtering, Filtering net supported by a porous alloy plate, perforated plate installed on the plate or column vector, while the carrier is moved to a system of job position and offline in the non working position switch between. The screen changer can be fitted to any new or existing extruder, melt pump, reactor or other extrusion production line.. It can be used to filter any type of polymer, rubber or ceramic melt.